All transactions are safe and secure with a reliable history in online purchasing behind each of our associates. 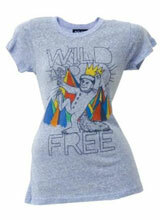 Buy the Max Wild and Free t-shirt to own Where the Wild Things Are clothing and merchandise. If you were born wild, then this colorful Where the Wild Things Are tee is for you. This Junk Food shirt features our adventuresome youngster Max in all his glory. High atop his throne, Max is attired in his white fuzzy pajama costume and adorned with the crown and staff bestowed upon him by the wild things of his imaginary forest. Pair this tee with a plush Where the Wild Things Are stuffed animal or action figure for a nice present for any fan. Whether you admit it or not, we are all wild children at heart. In addition to the Max Wild and Free tee above, browse the Where the Wild Things Are Clothing Gallery for more apparel like men's and women's clothes, kids shirts or hoodies.